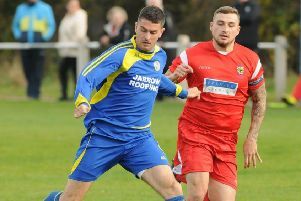 The excitement surrounding Hebburn Town isn’t just restricted to the supporters, that is the verdict of new Hornets signing Lee Kerr, writes Mark Carruthers. The three-time FA Vase winner became one of a clutch of eye-catching signings made by manager Scott Oliver. He followed the likes of Graeme Armstrong, Louis Storey and James Fairley in putting pen-to-paper to join the newly-promoted Northern League Division One club. 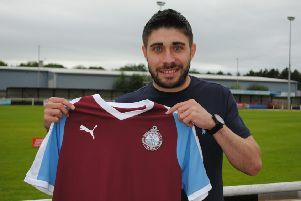 They were followed this week by the addition of former South Shields and Marske United midfielder Andrew Stephenson. There is a genuine excitement around the club at the moment and Kerr revealed that feeling is replicated by the players. Kerr said “I had a few conversations with Scott (Oliver) and he was keeping me up-to-date with what his plans were for the club. “I was trying to get out of him who was coming in, but he wouldn’t reveal too much. “It’s excited and I am sure the rest of the players are excited by the signings. “They have attracted good players, experienced players and there is no reason why we can’t follow what South Shields have done. Kerr spent last season with Jarrow Roofing and left when owner Richie McLoughlin folded the club in May. He spent most of last season watching events at Hebburn from the outside and admitted that the turnaround in fortunes has been ‘great to see’. “It’s a remarkable turnaround,” said Kerr. “I am a local lad and I come in here often to watch football and meet friends in the clubhouse. “The turnaround on and off the pitch is great to see. There is an excitement and I can’t wait to get going. “It’ll be great to get into a new dressing room and play in a new side. One of those familiar is Kerr’s former Whitley Bay strike-partner Paul Chow. The duo wrote themselves into FA Vase folklore with the Seahorses as they dominated the competition between 2009 and 2011.